Hallelujah! A Halloween horror film that isn't full of two-dimensional screaming teens and pointless unscary jump scares. A film about a grown up that walks my favourite line between primeval supernatural forces and crushing mental illness, crossing the domestic ghostly chills of Poltergeist with the slippery female neurosis of Repulsion. Single mother Amelia (Essie Davis) lives in a big ol' creaky house with her vampire-pallid six-year-old son Samuel (Noah Wiseman). Samuel still believes in monsters. So convinced is he that the bogeyman really does lurk in his closet and under his bed that he's fashioned a whole armoury of Home Alone-style weapons to protect himself. (Watch out for them: like the horror movie equivalent of a gun in the first act of a play, you know they'll come into use at some point.) 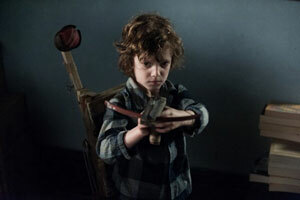 Needless to say, the weapons don't go down well at school, and Samuel finds himself suspended – the final straw for nurse Amelia, who barely gets to sleep a wink anyway due to her son's incessant monster nightmares. Is the Babadook for real? Is lonely weird kid Samuel imagining him? Or is Amelia, sleep-starved, stressed and still mourning her husband seven years after his death, projecting her worst fears outwards onto a shadow-like figure? The beauty of The Babadook is you can read it on so many levels: as a straightforward supernatural chiller in the style of The Woman In Black, a ‘woman on the verge of a nervous breakdown’ movie like The Innocents or, more recently, Lovely Molly, or even as a frightening allegory of the damage mental illness can wreak on a family, a reading that makes the intriguing ending even more interesting. Tense, unnerving and unpredictable, The Babadook is a fine horror film, clawing at that secret fear of the unknown that hides in everyone's soul, that cold lurch in the stomach that wakes you up at 3am and sends you cowering under the bedclothes. Yet it also taps into another adult taboo that's rarely explored in any kind of movie, horror or otherwise (with the bold except of We Need to Talk About Kevin): a parent’s horrible realisation that sometimes they simply don't like their own child that much.